Having a trusted team around you makes life easier. 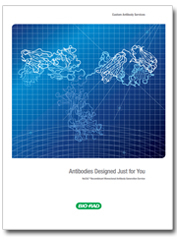 We are experts at what we do and will work with you to make sure you receive the antibodies you need. Our aim is to enable you to do outstanding research that leads to new discoveries and the excitement and rewards this brings. Every project is different, and our customers have a varying level of knowledge about how antibody libraries and phage display can be used to generate a custom product for them. For this reason we have an international team of technical specialists whose aim is to understand what you need to achieve with your antibody and provide tailored guidance on the service we can offer based on our extensive experience. Based on your final application we make recommendations for antigen requirements, selection strategy, antibody format, detection tags and immunoglobulin isotype. After our discussion we provide a detailed project proposal and once you agree to start the project your technical specialist acts as your personal point of contact, keeping you informed of the progress of your project and expected dispatch date. Think how much more you can achieve when you have partners you can rely on. Three packages provide the basis of the antibody generation service, and additional services can be added according to your project needs. Our technical specialists will work with you to design a project to generate and characterize the antibodies your research requires.